My father was trapped behind lines in the Battle of the Bulge. After sunset, deep in the black of the Ardennes Forest he was instructed to put his hand on the shoulder of the solider in front of him, as did that man, and the man in front of him. The snake of trapped men silently moved through the snow and the woods to the safety of morning light across the river. They did not completely escape detection. As the sun rose, the enemy awoke to discover the trail, grabbed their rifles and rushed in pursuit. Some of the men were shot as the Germans closed in. My father does not like to talk about it. I am named after the Captain who lead the men out of the darkness, a man who stood at the sharp end with compass and pen light and confidence. It was the highest honor my father could bestow on the man who saved his life. We are escapees, shuffling through the winter night terrorized. As I have said elsewhere, I am given to metaphor and this is a strong one. As best I know, the human species has no call to origins, to a place of conception. There is longing, however. Who does not long for a pen light in the darkness, a leading shoulder or a compass? How can we resist the clearing across the river? We cannot be ambivalent about being surrounded. I was thirteen at the on-set of the Tet Offensive. But it was several years prior to Tet, that I realized people die early waging war. I say die early in the context of the individual life, that men and scores of women and children, all still carrying the imprint of youth, expire and with them the potential of their lives. I recall discovering this and being shocked by it. Life, I reasoned, was so dear that surely it could not end like that for means so questionable. But it did. And still does. War is a fact of history. It is, too, likely a certitude of the future. But I am not writing to moralize on war. It is Memorial Day, the day we commemorate the men and women who died in military service. That war is the practice of death and dying is a sobering realization and we do well to remind ourselves of this by honoring those who have been subjected to it. 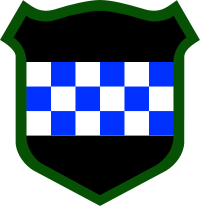 I am named after a Captain Douglas, 99th Infantry Division. Captain Douglas got my father out of the Ardennes Forest after the Germans broke through the lines in the winter of 1944. The Captain delivered him, and many others trapped and waiting in their foxholes, to safety, snaking them through the forest and escaping. The Battle of the Bulge is the single largest battle of World War II. More than a million men–600,000 Germans, 500,000 Americans, and 55,000 British–were engaged. There are estimates of up to 200,000 casualties for both sides. Many years later I contacted the Department of the Army and replaced the Bronze Star my father had been awarded during the war. It had been stolen. He was not interested necessarily in replacing it, and had let the war recede in memory. The paperwork that accompanied the replacement called my father a hero. He was moved when I gave it to him. He was polite in accepting it and seemed touched by the gesture. A few days later I got a letter from him. In it he said he was not a hero, as the service record claimed. The heroes, he said, where the one’s who did not return. We were having friends over for dinner this evening. I am the cook and was getting dinner prepped. The doorbell rang. Mary, a neighbor, upset, motioned behind her. “Your dad fell.” She pointed. My father was leaning, slumped, against the wall in the courtyard, covered in blood. It is now six hours later. He has a broken nose and lacerations, but is fine–other than looking like he just fought George Foreman (pre-grill days). My father turned eighty-eight two weeks ago. He has not seen a doctor in fifteen years. And that time, fifteen years ago, was the first since induction into the service (WWII). He was a curiosity at the hospital tonight. “Mr. Bruns, you take no medicines, have no general practitioner and haven’t seen a doctor in a very long time.” He smiled, despite the blood stains, in confirmation. When they left the room, he asked me “How’d I do?” Great Dad, you did great. Two years ago I was in New York when my phone rang first thing in the morning. It was my father. “I’m so glad I got you,” he said. “I have terrible news. Your mother died last night.” It was out of the blue. She was gone, just, like that. I told him I’d be home in about three hours, that Carole and Jeff would come to him and then asked how he was. This is what he told me: “Last night your mother and I didn’t even turn on the t.v. We just sat and talked, maybe three hours. Then we kissed good night and went to bed. She didn’t wake up.” The story of my mother and my father’s last night together gave me comfort in a way that I cannot convey. “Dad, I said. We all will close the chapter of our life some day and what better way than to sit and talk with the one person you love most and then kiss them goodbye.” He said he understood this and that it gave him great comfort. It was a truth for him. He knew they had parted in the best way possible. Tonight I thought of this even as I watched him resting in the hospital bed. He has me, but his life partner has gone before him and he does not have her. He must be lonely and even afraid, I think–this man who made it through the Battle of the Bulge. He is here, in the bed before me, bloodied, and old and counting on something I cannot image to get him through. He is my father. I am his son.